SIX QUESTIONS WITH A WATERMELON CARVER: RYAN ALLISON - What About Watermelon? The highlight of our annual watermelon carving contest — besides the chance to see some incredible carvings — is getting to know some of the talented folks behind those carvings. Until now, I’ve only known them via the emails they send to me when they submit their entry. 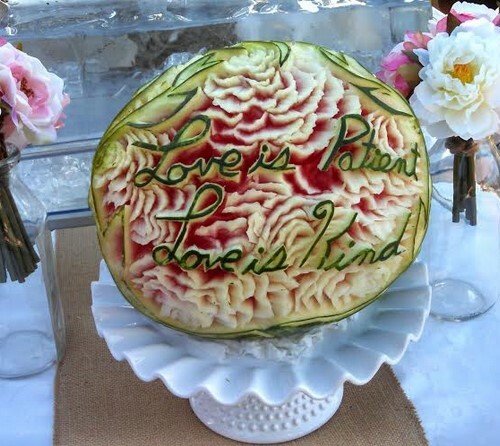 In this new monthly blog entry, I’m going to get to know a few of our carving contest entrants a little better by asking them six questions about themselves and their love of watermelon. First up is one of our most memorable watermelon carvers, Ryan Allison. Ryan is a 21-year-old chef from Spokane, Washington. In addition to being a chef at a golf and country club, he’s also started a fruit-carving company called The Garnish Guy. He’s one of the most prolific carvers in each of the last two carving contests, and he’s also one of most entertaining. One of the requirements for each entry is that the carver must submit a photo of himself or herself with his or her carving. Ryan happily obliges, but he takes the watermelon selfie to a new level, as you can see from the examples above. When not carving watermelon, I enjoy any number of other artistic activities, but I am self-taught in almost everything I do. I like to work with clay and I’m currently working on a tapestry. I also dabble in guitar and have literally just started learning the violin. In my free time, I like to learn new things, because learning new things keeps life from being boing and repetitive, and I am always up for trying new things! When I was just starting culinary school, a picture of a tiger carved out of watermelon was circling around the internet. Everyone LOVED that tiger, including me, so I took it upon myself to learn another new hobby. I had no idea what I was doing, so, like any self-taught hobbyist, I Googled it. It was terrible. Then a couple of years ago, I was at a chefs’ convention and met Chef Ray Duey. He taught me the basics in a three day weekend and the rest was up to me. Since then, I have carved for weddings, baby showers, birthdays, and I even raised $500 for a children’s hospital with one of my carvings. I like to create sculpture-type carvings. Don’t get me wrong, I can carve some fantastic flowers, but I like being able to take a piece of watermelon and turn it into someone’s favorite cartoon character, or favorite animal, or anything else that they want. The best feeling is when someone gives you a challenge and you blow their mind. My most memorable carving (below) was one I did for a friend of mine. He commissioned me to do a carving for his wedding to surprise his then fiancé. We spent an entire year going over the details and he changed his mind a good 30 times before I finally had to take over. The carving had everything he wanted. When he saw it, he cried, his wife cried, and his mother cried. You don’t get that sort of reaction every day. Wedges all the way! Wedges have everything you could ask for in a piece of food. It has a handle, all the meat is in one place, and it looks like a slice of pizza! I have a wedding lined up, but as far as the contest, you’ll just have to wait and see. I don’t want to give the competition an edge! UP NEXT: My first New Year’s Resolution recipe attempt! What a cool guy! 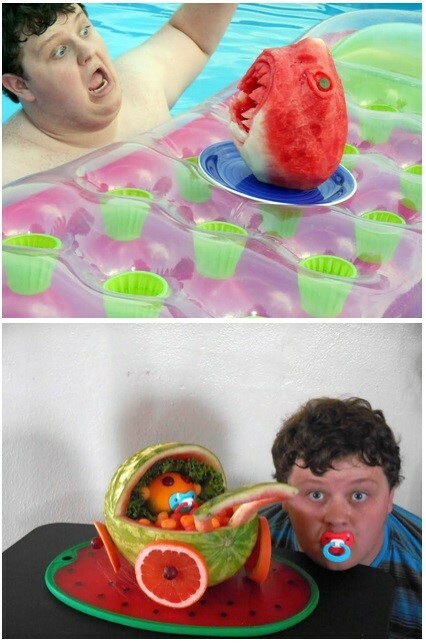 I hope to see many more of his watermelon creations this year! We agree, Steph! We love the creativity of all of the watermelon lovers out there!